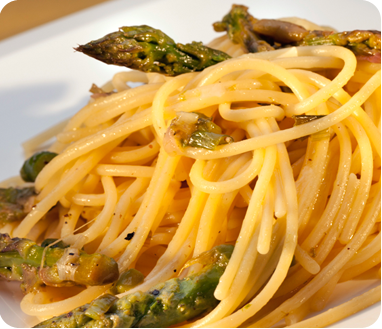 Spaghetti with Asparagus and Red Orange sauce - Mehadrin Tnuport Export L.P.
Take a tall pan, fill it with salted water and bring it to the boil. Tie the asparagus spears together and cook them standing upright in the pan for about 10 minutes. Then drain the asparagus, leave to cool and trim off the heads. Do not use the lower, tough end of the spear. Take another large pan, fill that one too with salted water and bring it to a boil. Add the spaghetti and cook it "al dente" according to the pack instructions. In yet another large frying pan, sauté the spring onions in the oil and butter. Add the asparagus heads and fry it all together for a few minutes, then add the thyme, salt, fresh ground black pepper and orange juice. Allow to simmer for another few minutes on low heat while adding a couple of spoons of water. Add the drained spaghetti to the pan with sauce and put it back on the heat. Add the grated Parmesan, give everything a good, quick stir and scoop it out into a serving dish.